The ‘sincerely yours’ hottest months of the year seem quite dull when it comes to traveling. If I were to recall the last trip or vacation I personally took, it would be in April when I went on a 7-day vacation with my better half. 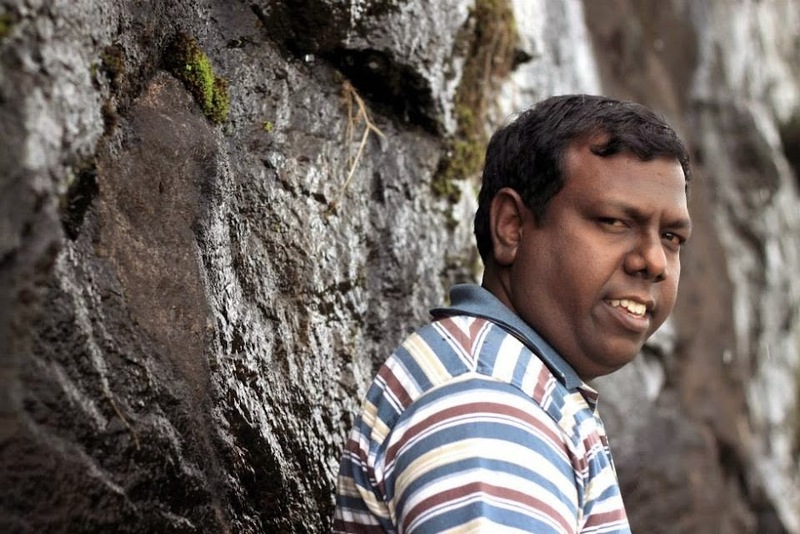 When the trip to Cumbum Valley was announced, it felt like rising from the dead. The promising prospects of exploring the surroundings on two wheels, riding about 1600 kilometers in a span of 3 days, yet another journey amongst the greens, yet another off-beat adventure to explore…factors enough to get me (anyone) high! Registered online and signed-up, the 10 of us (6 bikers and 4 pillions), I was eagerly anticipating the weekend succeeding July 13th. The day we were supposed to start with the ride, I had butterflies in my stomach just thinking about the prospect of yet another trip. In fact, so much seemed to be the excitement around that Krishna Teja turned up a day in advance on Jothi’s front door, ready and packed to depart! However, the one thing I overlooked back then – this would turn out to be yet another bunch of cherished memories. 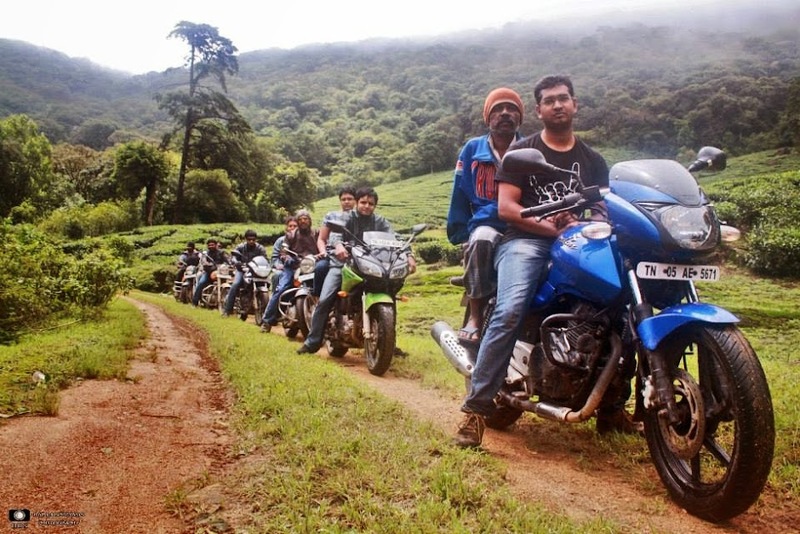 The riders decided to meet and commence their ride from the Chennai Trade Center on at 9.00 PM on July 13th. Vivek, Madhvi and Vishnu were expected to join from the other corner of the city (Tambaram, OMR); hence the meeting point was agreed upon at Chengalpettu Toll Plaza. However, the bikers commencing from Chennai Trade Center caught up with Vivek and Vishnu at Perangalathur and it was a joy ride thereon. 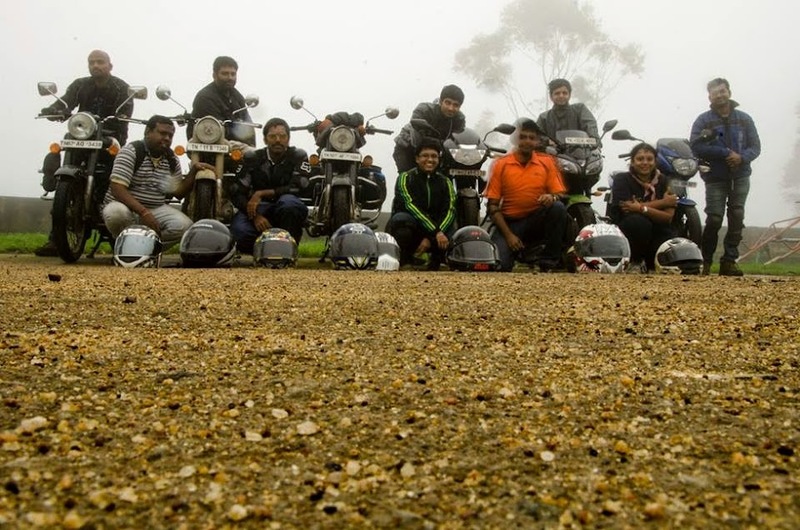 The 6 bikers (Kamal, Krishna, Muthu, Sudeep, Vivek and Vishnu) and 4 pillions (Balaji, Jothi, Kokila and Madhvi) stopped at Chengalpettu Toll Plaza for a quick catch-up and geared up for the ride that was to begin then. The ride commenced by around 10.30 PM from Chengalpettu Toll Plaza. A pit-stop/ tea joint/ stretch-zone awaited us at an interval of every 80 kilometers (roughly), while making the ride enjoyable yet comfortable. 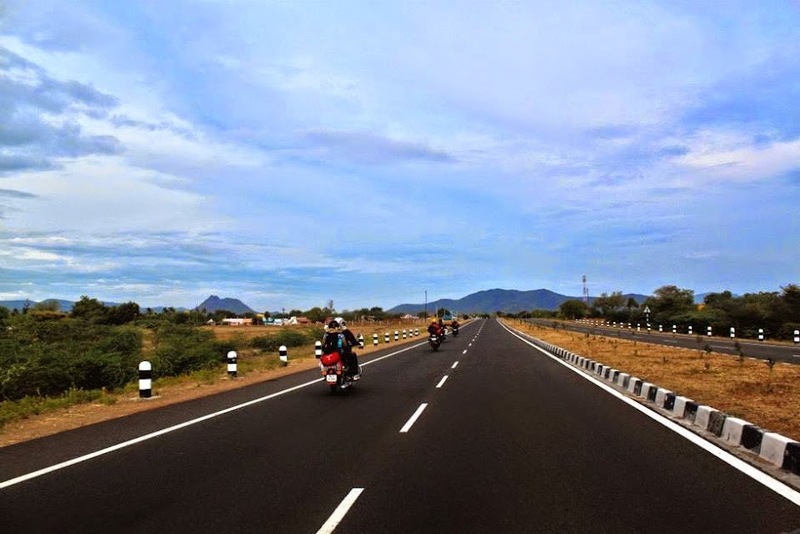 The order of occurrence of the pit-stops: Gear up at Chengalpettu (10.30 PM) – Bikers’ rest at Villupuram (12.00 AM) – Tea-break at Ulundurpet (2.00 AM) – Power nap at Trichy (4.30 AM) – Breakfast at Manapparai (7.30 AM) – Bikers’ rest at Dindugal (9.00 AM) – Fuel refill at Theni (11.30 AM). With our tummies chilled and bikes filled, it was time to begin the 20-kilometer ascend to the scenic Highwavys (Day 1). While at the base of the mountain, we were told that this was the best road we would get to see in the entire ascend. Wondering what’s in store, we started ascending on our 2-wheels. Hairpin bends awaited us in the early stretch, raising the altitude quickly. 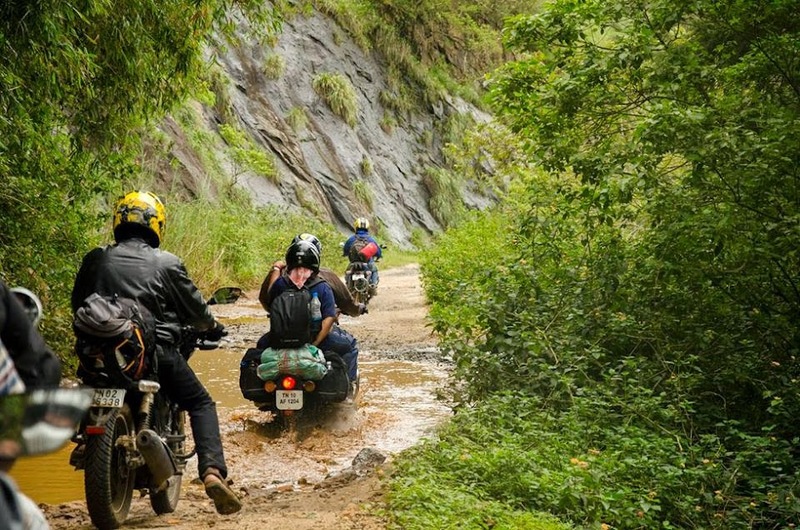 Furthermore, the paths were filled with potholes and muddy water…often it was a mere trail through which the bikes had to wade through: off-roading it was! Clouds strewn over the streets, the valley deep down the ravine never-endingly green, slight drizzle caressing our faces…it was quite a challenge for the bikers to ride beyond the 2nd gear within 5 kilometers of the ascend. The view however was Heaven; especially for the photographers who clicked away to glory while the bikes advanced inch by inch. 1/4th into the trail, we had a quick stopover for soodu out-from-the-pan vadais and chai. The hot food-n-drink trickled enough warmth in us to continue with the raise. At about 12 kilometers from the base, another halt awaited us only to get wet – the water stream. 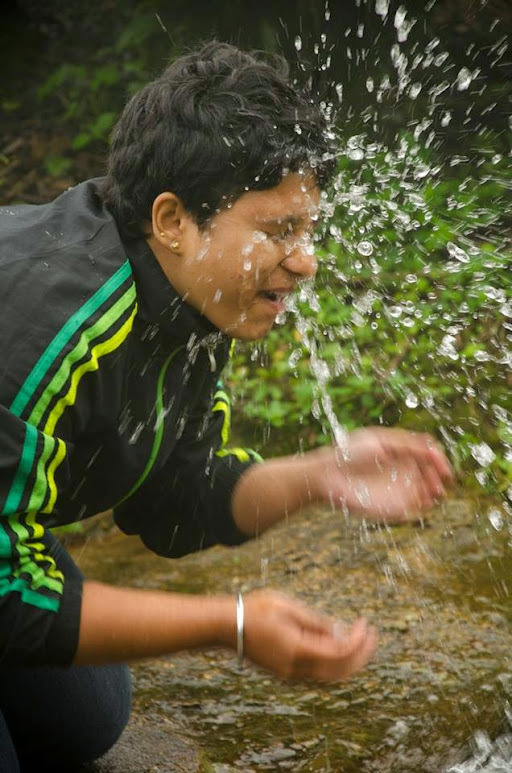 Madhvi and Sudeep got down for a quick ‘dip’ in the ice-freakin’ly-cold water…and lo! Madhvi’s jeans and shoes were all wet in just under a minute (obviously)! We also filled fresh water from the streams; a refreshing drink from the salty H2O that we get to drink daily. Higher up we continued, with the weather becoming only colder and rains only more brutally showering (though it was just a drizzle! )…finally making into the cozy comforts of Highwavys Inn at about 3.00 PM. While Krishna and Vivek (oldies tired from the ride), went in for a quick slumber after the overstuffingly hot lunch savored of sambhar, kaai (unable to figure out till date what kaai), rasam and rice; the 8 other energetic ones went to Senthil Tea Kadai for a quick tea. 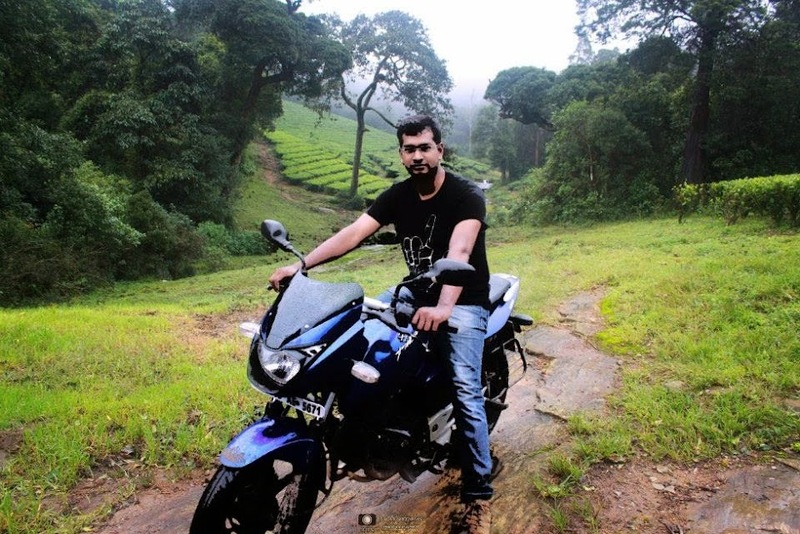 The tea kadai proved to be another 20-minute ride from Highwavys, letting us experience yet another off-road ride. The tea, undoubtedly, tasted good (seeing as the area is known for tea plantation); a few others called for yet another round, giving way to chitters and chatters until it was dark and time to be back in the rooms. Day 2 dawned bright and cloudy, and it was the day to unwind for sight-seeing. Starting the day with hot vadais and a breakfast consisting of idlis, chutnies, pongal and tea, our day started with touring the Manalar Dam. A lot of captures found their way into photographers’ lenses: scenic snapshots, solo snapshots (to be the next display pic of course! 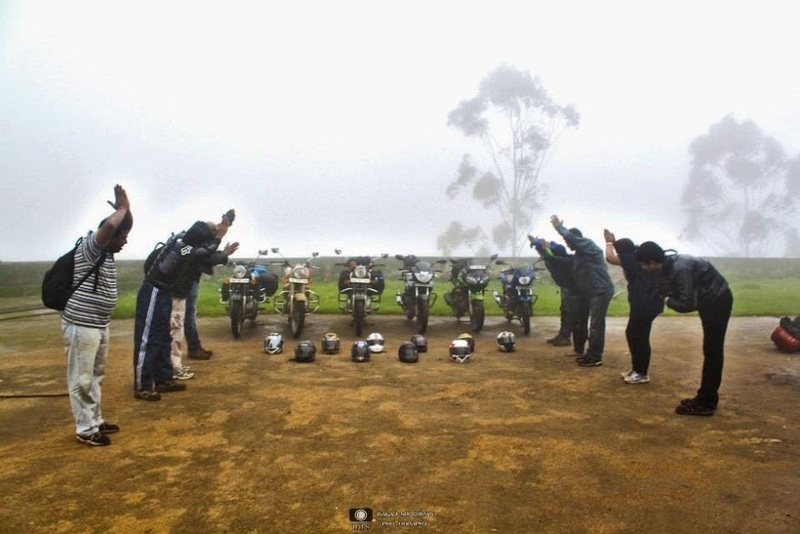 ), biker’s pride (THE bikes), and a few candid ones. 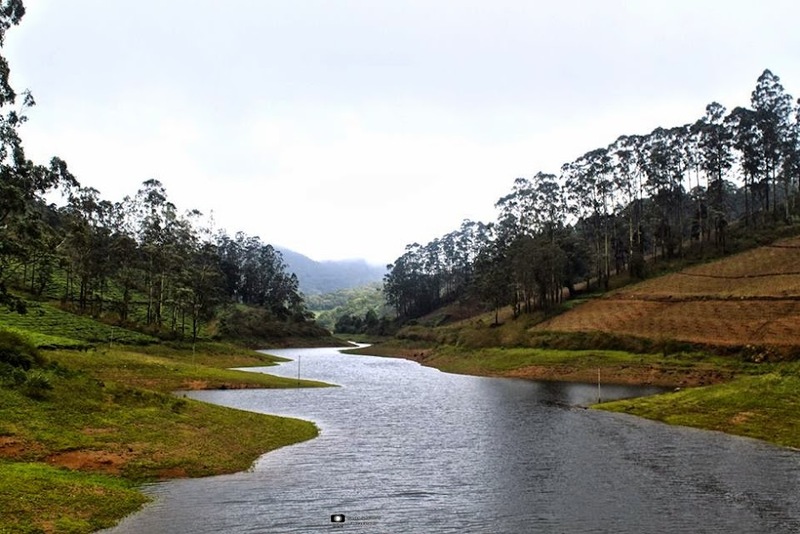 After the dam, we passed through the Venniyar Tea Estate to make way into the Eravangalar Dam. It was a pleasant surprise to see the sun phase in and out here; the mild warmth was utmost welcomed. On reaching the dam, two people at the site absconded with Krishna’s bike! It was only when we started wondering if we were to get back the bike that we saw the bike return. Wondering until date, as to what they did with it! 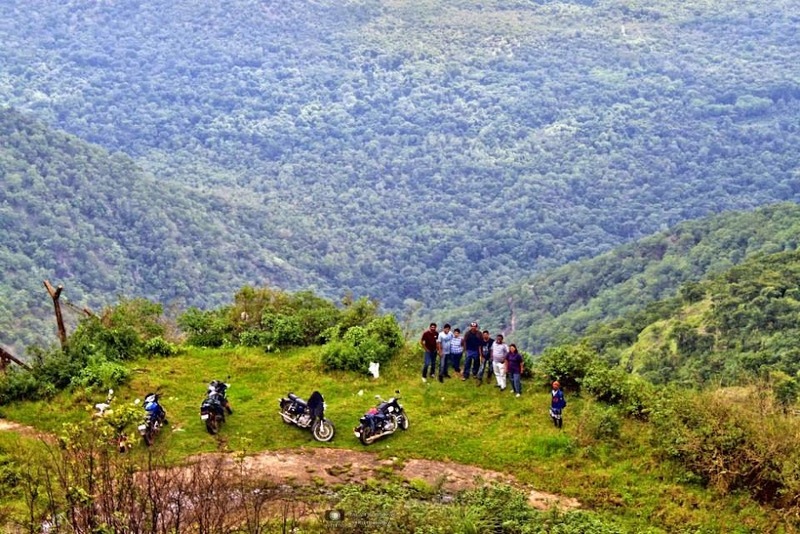 Our next pause was at the Thekkady-Cumbum viewpoint and oh boy! Was it a beautiful (understatement) sight!! The point provided a view of the ENTIRE valley, giving us an idea of the altitude and depth we were standing at, while at the peak. It was AMAZING – the view from there – valley of the greens, plains at the base, wind on the face, sun in the sky. With tummies starting to growl once more, we made our way back to Senthil’s Tea Kadai for the made-to-order chicken curry and biriyani (ordered earlier that morning). (For the veggies, it was kurma with biriyani.) Yummm!!! The food was WORTH the wait; the cold began dissipating as soon as we had the first morsel. As lunch was devoured almost at supper time, tea was a subsided affair that day. After lunch, the last point we headed to was the Highwavys Dam and Lake. While Jothi and Kamal got in for a dip, the others rested their roasted backs on the comfortably sprawled tarpaulin. Yet another set of click-clicks and as the weather gave way to darkness, and we came back to the rooms. We began to descend by 9.30 AM. 3/4th way down the trail, we were back at the potti kadai where they served soodu out-of-the-pan vadais with tea. Gobbling those up (which also happened to be our breakfast), the next pit-stop was to refuel the tanks at Theni. The journey followed onwards as: Lunch at Dindugal (1.30 PM), Tea at Manapparai (3.00 PM), Snacks at Trichy (5.00 PM), Tea at Ulundurpet (7.00 PM), Dinner at Tindivanam (9.00 PM), onwards (to depart) Home Sweet Home at Chengalpettu Toll Plaza (12.00 PM). One of the longest yet fun-most rides taken on 2-wheels indeed! Thanks to Kamal and Jothi vel for yet another fabulous trip organized! Cheers!